Drawing on a postcolonial legal history of the United States’ territorial expansionism, this book provides an analysis of the foundations of its global empire. Charles R. Venator-Santiago argues that the United States has developed three traditions of territorial expansionism with corresponding constitutional interpretations, namely colonialist, imperialist, and global expansionist. This book offers an alternative interpretation of the origins of US global expansion, suggesting it began with the tradition of territorial expansionism following the 1898 Spanish–American War to legitimate the annexation of Puerto Rico and other non-contiguous territories. The relating constitutional interpretation grew out of the 1901 Insular Cases in which the Supreme Court coined the notion of an unincorporated territory to describe the 1900 Foraker Act’s normalization of the prevailing military territorial policies. Since then the United States has invoked the ensuing precedents to legitimate a wide array of global policies, including the ‘war on terror’. 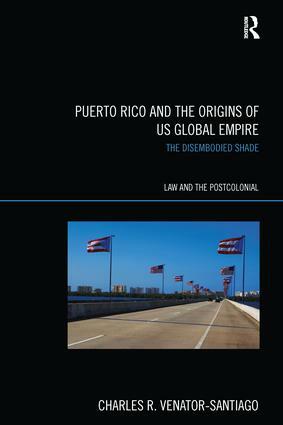 Puerto Rico and the Origins of US Global Empire: The Disembodied Shade combines a unique study of Puerto Rican legal history with a new interpretation of contemporary US policy. As such, it provides a valuable resource for students and scholars of the legal and historical disciplines, especially those with a specific interest in American and postcolonial studies. Professor Charles R. Venator-Santiago is Assistant Professor with a joint appointment in El Instituto: Institute for Latino/a, Caribbean, and Latin American Studies at the University of Connecticut. He is also a board member of the Latino/a Critical Theory (LatCrit) organization and President of the Puerto Rican Studies Association (PRSA).